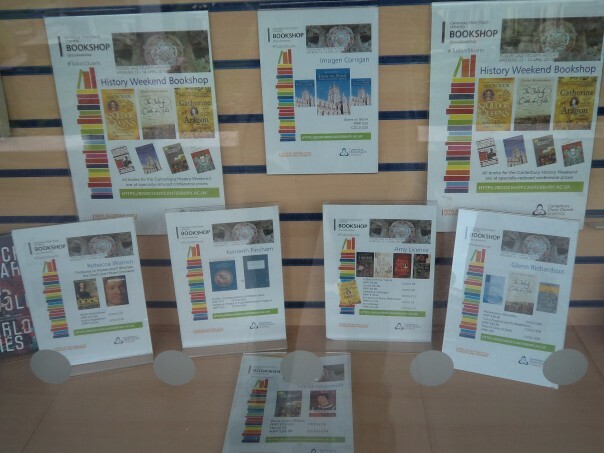 This week saw two events that were to a greater or lesser extent linked to the Centre. The first, and the one organised by the Centre through Professor Louise Wilkinson as co-director, was the Eleventh Annual Becket Lecture. 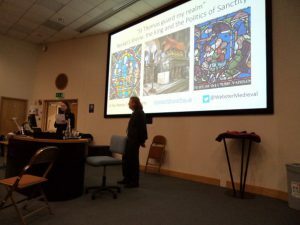 Readers of the blog will know that Dr Paul Webster, from Cardiff University, was due to give his talk on royal responses to the martyrdom and cult of St Thomas of Canterbury last night. An audience of over 120 listened as he outlined the case for Henry II’s and his successors’ use of the relationship they developed between themselves, as England’s royal family, and this quickly internationally important saint. Being highly intelligent, although very hot tempered, hence, perhaps, the initial problem, Henry II was able to undermine his rivals in 1174 when at the conclusion of his very public penitential pilgrimage to Becket’s crypt tomb he received exceedingly welcome news. The capture of the king of Scotland, William ‘the Lion’ at Alnwick, was a fatal blow to the rebels’ cause, as well as demonstrating that the newly recognised saint had forgiven Henry and was now his heavenly supporter. As Paul noted, Henry made this tangible by thereafter including the phrase king ‘Dei gratia’ in his charters. Such activities Paul was keen to show are to a degree at odds with the idea that Becket was an anti-royal saint and thus ‘popular’, an idea, he noted, that had been put forward by J. C. Russell in the early 20th century and again by Nicholas Vincent in the recent historiography. One of the factors he examined was the frequency of royal pilgrimage to Canterbury by Henry II and his sons, and that at times this itinerary included other saints associated with the Plantagenet kings, such as St James the Great at Reading, St Edmund at Bury in Suffolk and St Edward the Confessor at Westminster. Indeed turning to Henry II’s grandson, another Henry, the latter was exceedingly busy in 1220. Firstly, on Whitsunday 17 May he was at Westminster Abbey for his re-coronation, which formalised his right to rule, before just under two months later having a major role in the translation of St Thomas’ relics to the new shrine in Canterbury’s Trinity Chapel. Both rituals had been well orchestrated by Archbishop Langton and must have made an extraordinary impression on the teenage king. Just as a matter of interest, bear was on the menu at the great feast served afterwards. In addition to the act of pilgrimage, these twelfth-, thirteenth- and fourteenth-century kings often gave exceedingly extensive and expensive votive offerings – either before a hoped for event or to mark a successful outcome. These took a variety of forms, and, as well as gold coins, precious stones and jewellery, wax in the form of tapers, great candles and models was especially favoured by Edward III. A famous example of such a votive offering being a wax model of one of Edward’s favourite falcons that had become ill.
Canterbury and St Thomas were also used by these kings with regard to giving thanks for peace settlements, as a place to hold delicate negotiations, and to bolster marriage alliances, the latter also helping to spread the cult – as illustrated by a mosaic depiction of St Thomas at Monreale Cathedral in Sicily. To a degree, this brought in female members of the royal family, Becket was invoked at times of childbirth, illness and death, but war was perhaps Becket’s most prominent ‘intervention’. Thus, Edward I observed the saint’s feast days when on campaign, particularly against the Scots. However, this rather fell apart when the king died on the feast day of the Translation and his son lost at Bannockburn – a sure indicator, as Robert the Bruce noted, that St Thomas was now with the Scots. Just two further points, Paul mentioned the lost cycle of wall paintings in the Trinity Chapel that had included c.1220 the royal saints of Oswald, Edmund and Edward the Confessor, as well as from a local perspective King Aethelberht of Kent. Secondly, the interesting history of the ‘holy oil’ given to St Thomas by the Virgin Mary that was first recorded in 1318-19 but is especially important for political historians of the Lancastrian kings – Henry IV the first to be ‘correctly’ anointed with it at his coronation. Thus, as Paul concluded, St Thomas was more than just an anti-royal saint, and, even if the cult may have appealed to the crown because it promoted repentance and reconciliation, its political value, in the form of the saint’s support was not lost on either the reigning monarch or his enemies. This means that in the world of spiritual politics, the cult of St Thomas of Canterbury probably has no equal! 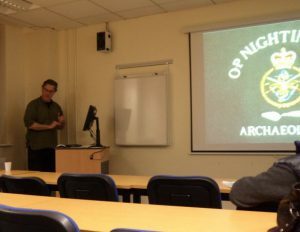 After this interesting lecture, several members of the audience headed across campus to hear Dr Andrew Richardson (CAT) and Sergeant Diarmaid Walshe of the Royal Army Medical Corp describe the work of Operation Nightingale Heritage to help military veterans. In its earlier form, this project began in 2011 as a way to help service personnel, especially those who had suffered some form of physical or mental illness or injury. The first programme had taken place on a Bronze Age site – East Chisenbury midden on Salisbury Plain. Andrew had met Diarmaid there and thereafter Canterbury Archaeological Trust had become more involved because a group had then come to the Folkestone Roman villa excavation. Even though things had not always gone to plan, as each group learnt from the other matters have definitely improved. For, as Diarmaid explained, archaeology is just the vehicle – even if it seems to be a particularly effective vehicle – to provide a safe, social space for military veterans to recreate what they miss from their service life: a sense of purpose, teambuilding, community and giving something back. Among the more recent projects undertaken by Operation Nightingale Heritage are Hampton near Brook last September that involved evaluation trenches and landscape surveying in the search for a lost medieval moated manor house. However, the major focus has been on the Folkestone and Dover areas, which has and will increasingly involve staff from Canterbury Christ Church, especially Dr Lesley Hardy and Dr Ellie Williams (in Archaeology). In essence, there are two foci: the Anglo-Saxon and post Conquest history of Folkestone, particularly in connection with the area of the Bayle and St Eanswythe, and the landscape of the twentieth-century defences that form arcs in the hinterlands behind these two ports. 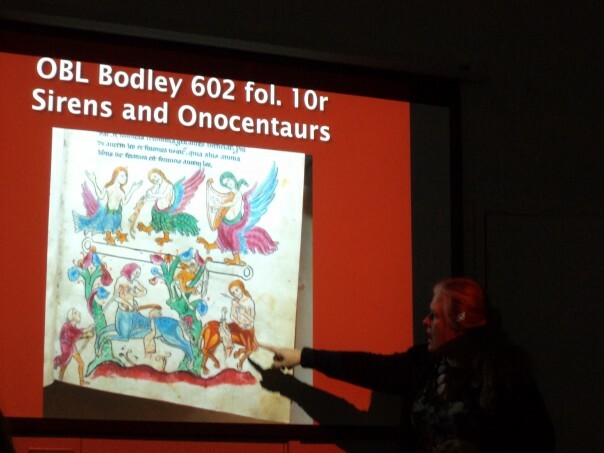 As well as involving archaeological excavations, these projects will include surveying and other non-digging techniques to explore and map the landscape, and research in the Kent archives. Consequently, there are opportunities for veterans who are interested in digging, those who prefer working with documents and those who enjoy mapping. In order to provide a sustainable future, Andrew and Diarmaid, with people from Canterbury Christ Church, have been looking to develop partnerships with the National Trust, Dover District Council and other bodies to explore the possibility of applying for Heritage Lottery funding and perhaps also funding from other charitable organisations. All of this seems excellent and it is great that CCCU is involved in these valuable community-based initiatives.